Welcome to the Purr Scouts Campfire Jamboree! It's been a busy day! Come join us by the campfire! There's lots of good things to eat! Hmmmmm, efurrything smells so good! There's catfish stew and mew can roast some fish! And what could be a better dessert than TOASTED MARSHMOUSIES??? Careful! Do not get too close to the fire! Now let's gather round and listen to some of Assistant Purr Scouts Director Max's famous ghost stories! Purrhaps mew have a ghost story to share! Not too scarey now! We don't want the youngest Purr Scouts getting nightmares! We are so happy mew could join us! 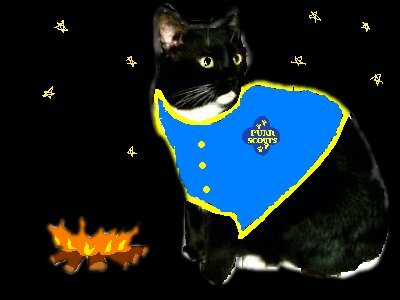 We are getting tired now, time fur Purr Scouts to snuggle in their sleeping bags and dream of more Purr Scouting fun!